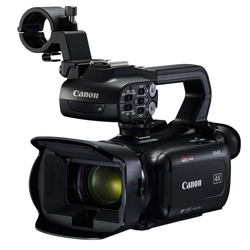 For fast performance in both capture and transmission, excellent for the dynamic world of Electronic News Gathering (ENG) as well as journalistic, documentary, corporate and higher education video production, look no further than the Canon XA45 Professional Camcorder. Featuring an advanced 4K UHD CMOS Pro Image Sensor, a powerful DIG!C DV 6 Image Processor and a phenomenal 20x High Definition optical zoom lens, the Canon XA45 camcorder captures expansive, high-quality 4K UHD video. Dual SD card slots that are compatible with universal SD, SDHC and SDXC memory cards provide super-high capacity and ultra-fast data transfer. Its 3G-SDI terminal lets it quickly and reliably transmit uncompressed video with timecode and audio embedded directly to broadcast vans and workstations. The compact XA45 includes a detachable handle for low-angle shooting and portability. Functionality is further enhanced with the addition of XLR inputs and an external microphone holder when the handle is attached. Combining a lightweight design, a 1.56 million dot electronic viewfinder and a 3.0-inch capacitive touch panel LCD, the XA45 is comfortable to operate for extended periods of time and in numerous environments. When there’s no telling what or where the next story will be, the XA45 is ready to go. A remarkably versatile, powerful and compact camcorder, it delivers the quality, speed and connectivity to drive a 24-hour news workflow.